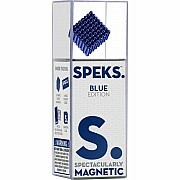 SPEKS' SAFETY POLICY Speks contain high-powered, Rare Earth magnets. 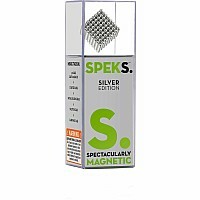 Even though Speks are half the size of Buckyballs, have a 90% reduced magnetic strength, and meet all safety standards including ASTM and CPSIA, any product that is misused or used by an unintended user can cause injury. 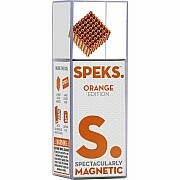 If a child gains access to Speks and ingests multiple magnets, it is possible that the magnets could stick across intestines causing serious injury or death. Therefore, Speks are intended for use by persons 14 years of age or older, and are not appropriate for younger persons. We do not advertise, display, promote, offer to sell or sell Speks to or for use by persons under 14 years of age. 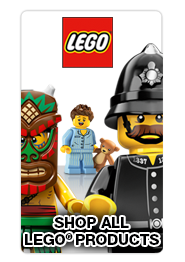 We will not knowingly sell to or accept orders from retailers who sell exclusively children’s products. Speks sold to a store that has both children’s and adult’s toys should be advertised or displayed along with other adult products. Examples of appropriate places to advertise or display Speks would be alongside kites, adult puzzles, science or modeling kits, or on a front counter next to fidget or adult impulse products. Retrospective Goods will use reasonable efforts to monitor the practices of Retailers with respect to this policy. If it is discovered that Retailer is not acting in accordance with this policy, action may be taken in Retrospective Goods’ sole discretion. Such action may include, but is not limited to, termination of Retailer as a reseller of Speks products, refusal to sell additional Speks products to Retailer, or notifying resellers and distributors that Retailer is a deauthorized reseller of Speks products.